The wedding backdrop is trending to more and more elaborate designs as couples compete for the most creative, gorgeous draperies possible. With hundreds of wedding backdrop boards on Pinterest and thousands of choices online, it can be a daunting task to choose the perfect display for your big day. That’s why OneWed is here to give you three tips for what to consider when choosing the one backdrop that’s meant to be. 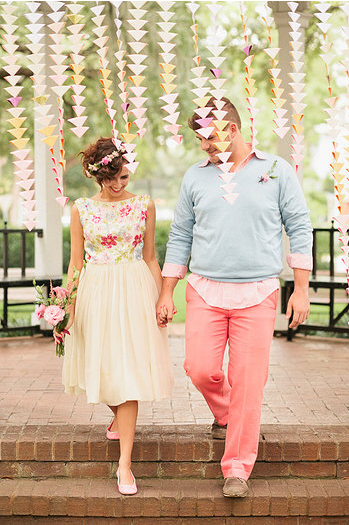 Hosting a rustic wedding? Wood or lace backdrops may be the way to go. Hoping for something more elegant? Ribbon or flowers are sophisticated design elements with plenty of room for customization. Whatever style defines your wedding, there are countless materials to make your backdrop uniquely you. If you’re going for a DIY, cost-effective solution, balloons, wax paper, origami, and ribbon are all fantastic choices. If your budget and venue allows, sequins, lights, and clocks can be unique additions guests won’t have seen before. 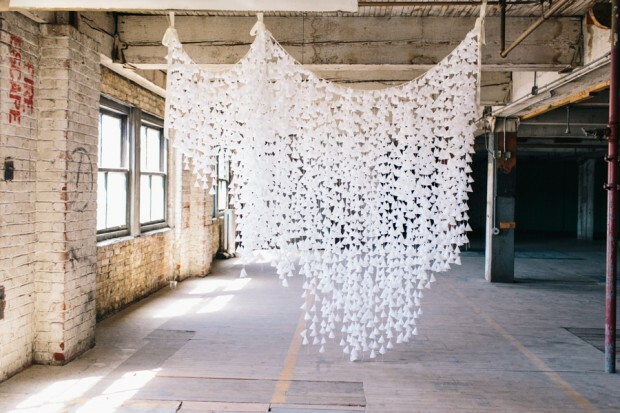 Keep in mind the size of your backdrop, budget restrictions and wedding theme when selecting your installation materials and then get ready to build away! We always advise couples to only take on a couple DIY projects to personalize their weddings; too many can be overwhelming and cause undue stress. If a customized backdrop is the DIY project for you — and you’re gung-ho about your backdrop display — then we say go for it! Gather your bridesmaids and make it a party. Need inspiration? Check out this YouTube video of how to make just one of the shapes!. Remember, though — many of these backdrops can be quite complicated and time-consuming. 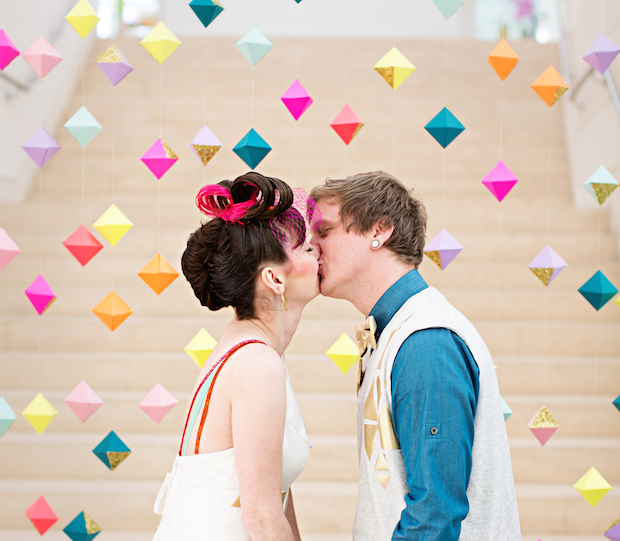 This simple octahedron backdrop is far from straightforward. 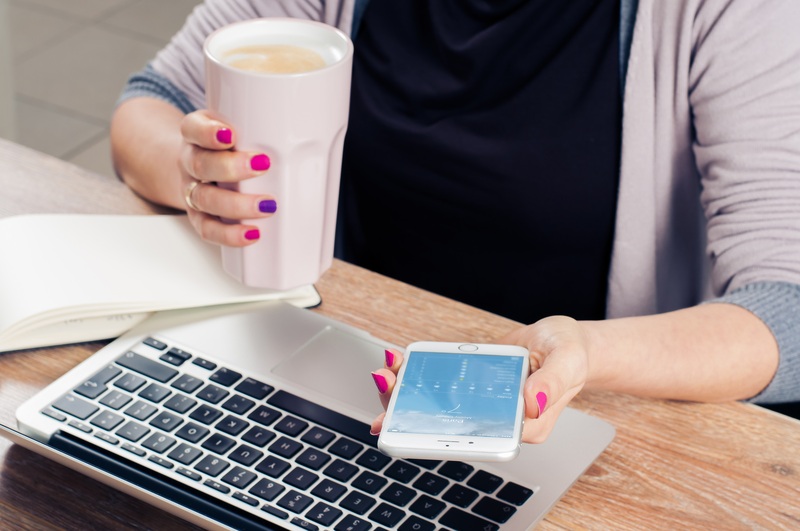 If your vision is too ambitious for DIY, don’t worry – there are plenty of design firms out there that can make your dream a reality. French Knot Studios, the designer of this fantastic neon backdrop, is one resource for customized installations, and one of our favorites. As one about to be married, we’re sure you have been overwhelmed with the pressure of making your wedding one-of-a-kind. The great thing about backdrops is that they are an easy — but effective! — décor piece that can be used throughout the venue as the main customized element. This antique China arbor from French Knot Studios is just one example of a backdrop perfectly tailored to the wedding’s theme to create just the right touch. When chosen correctly, your backdrop display can tie in all elements of the wedding in one perfectly draped, unforgettable piece of artwork. 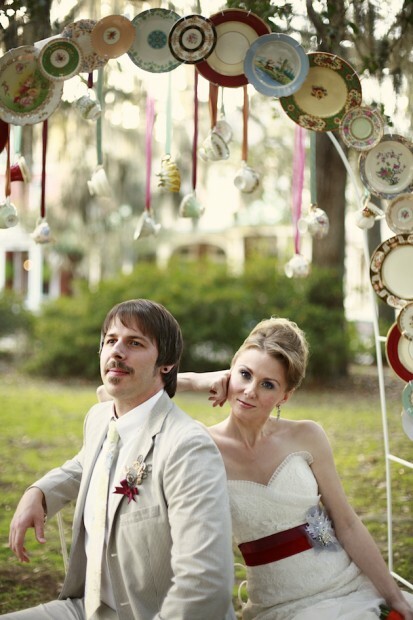 Get inspired with more beautiful backdrops on OneWed and feel free to email us with any questions. Photo credits (in order): Allie Rae Photography and Katie Kulper; Elle Golden and French Knot Studios; Izzy Hudgins Photography and French Knot Studios; Izzy Hudgins Photography and French Knot Studios. OneWed makes wedding planning smart & simple with an imaginative approach to your journey down the aisle.